If we want to solve for or describe a region in a coordinate plane, we can use linear inequalities. Linear inequalities give us a set of solutions as opposed to just one solution. You can solve linear inequalities using similar methods as in solving multi-step equations, except that there are extra rules when using multiplication and division. We graph linear inequalities by shading regions of number lines or coordinate planes. When you're studying Math a lot of the times you're looking at two things that are equal to each other like in an equation. 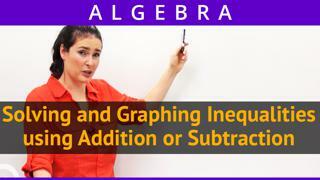 But sometimes you're looking at things that are not equal and so we use the word inequality to describe those and inequalities have a whole separate type of writing stuff which is called notation, there is a whole separate kind of notation and there is a whole another way of graphing it. So it's really important when you guys are starting to study inequalities that you keep a good list of vocabulary with you also keep a good list of notation which is how you write the stuff and then also probably keep some examples handy if you can. So like here's what I'm talking about, we know the number 9 is greater than the number 3 so to write it using inequality notation I write it like this. 9>3 and that's how you read it. You read from left to right just how you read like words, move from left to right. This sign > means greater than. I could also write some number is less than another number like I could say -5 < -2, because a negative 5, has a smaller value than negative 2. It's kind of tricky right because 5 would be a bigger number than 2, but when you negativize them becomes -5 < -2. Here is where it starts to get a little bit confusing, things could also be notated like this, I could say 9 is greater than 3 or I could say 9 is greater than or equal to 3. When I add that little dashy on the bottom what that means is greater than or equal to, or equal to. So that's confusing because either one of those symbols would have worked. Same thing instead of my -5 < -2 I could also write -5 is less than or equal to -2 or equal to. Just to make things even more confusing there is one more sigh I'm going to show you, and it looks like this, I'm going to put an equal sign and then put a slash through it, it's an equal sign with a slash through it. What that means is does not equal -5 does not equal -2, that's something else that is a little less common and you probably won't work with it as much in your Algebra class but you'll see it a lot in the future. So those are some notation again notation means how to write things, those are some notations you're going to want to keep in mind. Another thing that becomes really important when you're doing inequalities is graphing them. Now only do you have to be able to write them and use the correct symbols, but you also have to be able to graph them and you'll see a lot of this as you go through your studies. The first thing to keep in mind when graphing is how many letters you have. Do you have like just one letter like x or only m or only t or whatever. If you have only one letter it's going to be graphed on a numbered line and it's going to be using open circles and closed circles. So if I have just one letter and I'm graphing on a number line, these guys both receive open circles on the number line. These symbols would receive closed circles, and it will make more sense when you see some examples but what that means is that, this number is a solution that's why it's colored in. This number would not be a solution it's like a whole, and that will make a lot more sense when you start seeing some specific pictures. When you're graphing with two variables, usually using the letters x and y you're going to be graphing on one of these Cartesian Coordinate planes and there are a couple of things to keep in mind when you get going with those. The things to keep in mind are not only is it a line that is vertical or horizontal in terms of the slope it also might be a diagonal line using your y equals mx+b techniques you have to keep that in mind. You have to keep in mind whether the line is dashed or solid and the way you tell is that these guys get a dashed line in two variables, these guys get a solid line in 2 variables. And then the last thing to keep in mind anytime you're graphing an inequality in the xy plane, in the Cartesian Coordinate plane when you have 2 letters x and y you have to do some shading. And that's something we're going to be practicing in your future Math classes but it's really important that before you jump into this you have a whole bunch of really good notes you can keep handy as you go through your study of inequalities. Before I let you go there's one last thing I wanted to tell you about and that is when you come to word problems, there are some tricky phrases you want to watch out for. One thing you might see is does not exceed think about what that means if something does not exceed 10 that means like it has to be less than 10 and you're going to be using one of these signs. Or if something does not equal, you're going to be using one of these guys. If something is no more than 5, you're going to have to decide is it going to be smaller than 5 or is it going to be smaller than 5 with a closed circle, smaller than or equal to 5. Those are some really tricky definitions and really tricky phrases you're going to have to watch for in the word problems and you'll probably deal with them on a case by case basis. But again you guys write this down somewhere like on a note card or something that you can carry with you to your Math class. This is going to be like your cheat sheet kind of, this is all the tricks that you're going to want to remember when you just go through your study of inequalities.